I've got involved in a discussion with Craig Perko of Project Perko about whether or not random level generation can create interesting levels. You can follow the conversation here. I don't even want to go into the discussion about language and UI, which he touches on, as I've got strong opinions there as well. But the emotional content of games... well, that's something I want to write more on. Depending on how long this chat goes for, I might start doing blogged updates instead. By the way, I think Project Perko is a great blog. Craig touches on a lot of game design issues in a thought-provoking way. 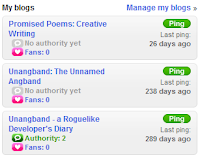 Hmm... according to Technorati, I've not updated this blog for 289 days. And a quick Google search for "Technorati broken" reveals that I'm not the only one experiencing this problem. Anyone out there have a good suggestion for a replacement? Preferably one that doesn't rate sites that just re-syndicate existing blog content higher than sites that create original content. While we're at it, I'm having a bizarre end of month rush to push my post count up for February. My apologies for the lack of posts: I've been on the road with work and generally busy with real life. I should apologise even more to Mikolaj who has been developing Unangband pretty much in my absence for the last two months. For those interested, dropping my total post count to 20% of what I did in January, only resulted in a 10% reduction in traffic (from just under 5,000 unique visitors in January, to about 4,500 for February). I think I now have enough of a back catalog of content to get linked to by new sites for older articles. There's a variety of different ways of learning something. Some people are visual learners, others auditory and a few tactile learners. There's also different ways of telling people things. You can use demonstrations, proofs, rhetorical persuasion or rules of thumb. Rules of thumb are useful as a short-hand guide to life, but not necessarily convincing. I could tell you that the best hands only strikes fighting style is boxing, hands and feet striking style is Muay Thai and ground fighting style is Brazilian jiu-jitsu. To demonstrate that, you and I would both have to engaged in years of martial arts training, possibly in differing styles, and then make a qualitative judgement which we would not necessarily agree on. Luckily, I'm able to give you a second hand set of rules of thumb from John Will, saving us both a lot of time and effort. My rule of thumb for games design, stolen shameless from David Sirlin, is to study games that have longevity. Years of playing games is not necessary: a comprehensive and well-written survey of how to play these games is probably sufficient to give you an overview. The games David recommends, I've already quoted once today: Chess, Go, Poker, Starcraft and Super Street Fighter 2 Turbo. I'd add NethackSangband and Magic: the Gathering to that list. I'd like to add an RPG as well - perhaps Call of Cthulhu. Unfortunately Dungeons and Dragons, Traveller, Runequest, GURPS etc. having changed and expanded their core rule sets too often to qualify (Nethack and Magic: the Gathering have just tweaked theirs). The other rule of thumb, of course, is to design games and play them. Constantly. As for being a good blog writer and amateur journalist, I'm still working on that. I've yet to see a good set of rules of thumb for this. Give me another ten years and I'll be able to write some. I've just been reading through a long and interesting discussion about game design vs. game implementation at TIGSource, with the designer of 300 Hundred Mechanics, Squidi, on one side of a debate and a number of interesting and thoughtful responders on the other. Have a read - it descends into flaming perhaps in the last 20% of the discussion, and that in itself is instrumental as a demonstration of when you should walk away from an argument. I'm really torn about what to say about the discussion as a whole. I think the 300 Hundred Mechanics is a great website concept and one that has attracted a huge amount of well-warranted publicity. But at the same time, I fall on the other side of the argument: a game concept is not the same as a game design. A game design is only as good as the game play that it creates. And to get game play, you need to be able to play the game. This doesn't require programmers: games as a medium are not limited to computer games and you could easily say the same thing about board games or role playing games or dice games. But you need to ensure that the rule space of a game doesn't have gross exploits, that there aren't degenerate strategies that rule out useful decision making, that the game play is sufficiently deep to remain interesting. You want to have Prisoner's Dilemmas and risk vs. reward and sufficiently unpredictable behaviour (whether that unpredictability comes from a random number generator or an opponent). The game design succeeds or fails when the rubber meets the road. Games evolve, breed, die. To evolve, they have to live. To live, they have to be played. A concept of a game just doesn't get the chance. I mentioned previously that John Harris of @ Play had interviewed the creators of Dwarf Fortress and was taking his time writing things up. The interview is now up on Gamasutra and covers the making of Dwarf Fortress in 10 pages of dwarfy goodness. It's a great chance to understand some of the thinking behind the game - and a good companion piece to Tarn Adams' interview on Geek Nights. And other roguelike developers? Yes, you are doomed. Procedural content generation gets briefly mentioned in this good overview of how to make and bring to market an indie game. Well worth reading if only to solidify your ideas on how to get a game out, and as a good list of resources in how to help that endeavour. Another brief note in the ongoing series of brief notes about how I'll get around to writing an article on failure in games. An article in the February issue of the journal Emotion points out that death is now seen as a pleasurable respite from the tension of playing a game, as opposed to the penalty of failure. This particular article has floated around the blogsphere over the last couple of days, but I suggest you read the original text to see how the lack of permadeath in FPS games leads death to become a euphoric interlude between stressful killings. 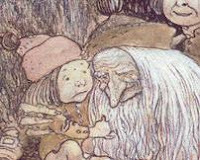 When I die in Unangband, I experience the not entirely satisfying feeling of a cold skeletal hand gripping my clammy heart, as the overconfidence drains from my body in shock. How do you feel when you die in roguelike? I'm sure that a nicer bar chart view of the above would be more interesting, but that'd take time. Next poll - with the 7 day roguelike competition coming up, I should really be giving it more coverage. If you've read and got excited about my recent series on procedural content generation, then you'll want to read the preview of LOVE over at Rock, Paper, Shotgun of a procedurally generated MMORPG being developed by Eskil Steenberg. The game sounds high-concept, low-entry, challenging and roguelike-like. Why do I add the R word? It has a complete implementation of deformable terrain - a feature of many roguelikes that I completely failed to mention in a recent poll. Why Do Games Still Have Levels? The next poll is an ironic reflection of the amount of free time I have available at the moment to do anything outside of work. My latest article for GameSetWatch has just gone up. This is a some what tongue in cheek examination of the characteristics of amateur games, and why I think they're different from indie games. It also seems to have provoked a mixed reaction. You can read it here. You might want to have a read of this definition of a role-playing game, by one of the developers of Age of Decadence. Then read the interview on Rock, Paper, Shotgun, and the discussion about the strengths and weaknesses of turn-based play that preceded it. And then you can follow-up with my pre-written rebuttal of why role playing in a computer based RPG doesn't make any sense. This release was prompted by Mikolaj Konarski reminding me we should probably do a beta release at some point, and pointing out that I hadn't added any broken features or crazy ideas in a little while. Mikolaj also reported the majority of bugs in this release, as well as fixing most of them. Check the Unangband home page for more details.